I wonder how many people bought those expensive drilling machines to make holes on the sea glasses. I was ready to get one, too. But the one I wanted wasn't available at the store right away. I was telling the sales person why I needed the machine. Well, I didn't have to buy the machine after all! He recommended the drill bit especially made for glass and tile. It wasn't really cheap but it's about tenth of the cost of the machine. If you have an electric hand drill, just get the bit for glass and tile (don't buy the cheap one, they won't last). Now you are ready for the project ! It works fine and it's so easy, too. I didn't even bother to wet the glass to drill the hole (see important note below). The key to drill the hole using this drill bit is that you drill almost to the other side and turn it over and drill from the other side. This way, you don't have to worry about chipping the edge of the hole. Works every time. Comments for Who needs an expensive machine for drilling holes in sea glass! Great! We're glad it worked for you Cakie. The best, easiest and cheapest way...a Dremel and ask your dentist for their old drill bits! They work very wel! I'm not sure when the comments were written by people offering to drill sea glass but I'm definitely interested! Please contact me if anyone still offers this service. I'd be very appreciative! What model of Dremel is recommended? Presently I just want to drill holes in my beach glass, but eventually will move to using a Dremel for filing, sanding, cutting, polishing. I have been drilling sea glass since 2009. I use a hand Dremel in a drill press. I only use diamond drill bits, mostly 1mm, 1.5mm & 2mm. First, I encourage wearing safety glasses always! Not just eye glasses. Next, using the drill press keeps your hands free to manipulate the glass & the press lever. Always drill with water! It cools the glass, lubricates, & keeps you from breathing in the fine glass particles in your lungs. I use a plastic container with a block of wood & a sponge. I drill each piece of glass under water. Yes, under water. I have much success with this technique!! I have one of these "expensive" watercooled drilling machine and never regreted the investment. I use it mainly to drill holes into gemstones but of course it's pretty good for drilling seaglass as well. The diamond drill drills up to 1000 holes into gemstones and probably up to 2000 holes into glass (it's a much weaker material than e.g. quartz). The time spent on drilling a hole through a piece of glass is ~ 20 seconds, a blindhole on top to glue an eylets in is drilled in ~ 10 seconds. The constant water stream cooling the glass and the drill makes perfect holes and avoids the chipping on the edges. I love it, and considering the amount of stones/glass you can drill with one bit, the time spent per drill, the quality and the failure rate (< 1%) relativized the investment already. Can I use a cheap Dremel? I was wondering if I could use a cheap mini mite cordless Dremel to drill sea glass? If so, do I also need a drill bit for diamond drills? I'm new to this so just making sure I can get everything I need in one stop! In the article that Toshi Kanno wrote, there was a photo of the drill bit. However, in your comments you include a link to another site that sells drill bits which are clearly not the one in the photo. This is a bit misleading because the story is about one drill bit and then if we go to buy it, we end up with a core bit, which is not the one that the story is about. Can you please correct that so we know which one to buy? Thanks for bringing that to our attention. 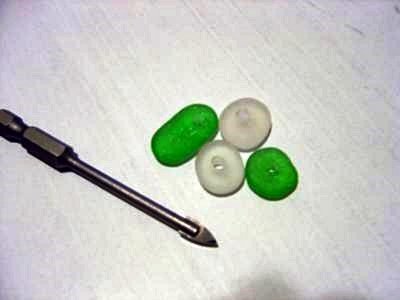 I have changed the link to go to a jewelry-size bit of the type best used for small sea glass. I need some one to help drilling my sea glass. I'm just a beginner. I will drill glass for anyone of any amount (as I am unemployed) I have so much drilled right now, I think I better start making my jewelry. Here is a response to "where to get you seaglass drilled" I just came across this site, hope it helps. As for me Im gonna try using my dremel. 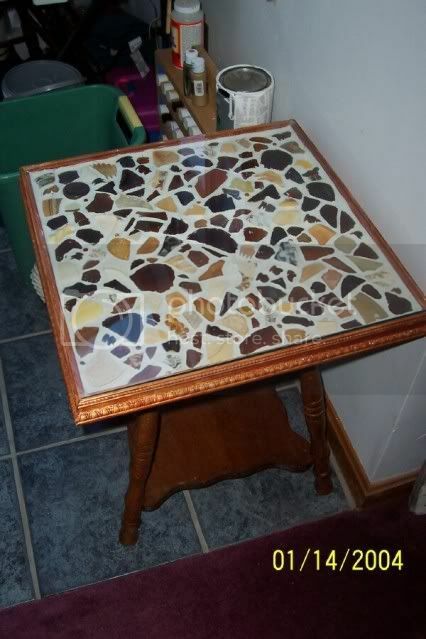 Can you drill beach glass holes for my beach glass? Unfortunately, we don't offer that service anymore. However, perhaps one of our viewers does and will let you know who to contact.